Good calling and understanding duck behavior is what separates mid and late season successful duck hunters from the rest of the pack. Often this is the result of always being on the lookout for good information and practicing calling as much as possible. If you haven’t picked up your duck call since last season, you better start now to be ready for this season. Get a good CD or DVD and imitate the master on the screen or coming through the speakers to you. Some might think the best place to practice is at home. In your car, as long as you can pay attention to your driving as well, is the best place. You’re alone; you don’t have to pay attention to volume and most importantly, especially if you commute to work, is you get regular practice. Like many activities that require muscle memory, more repetitions and less time is better than less repetitions and more time: ten minutes a day, everyday is much better than one hour once a week. 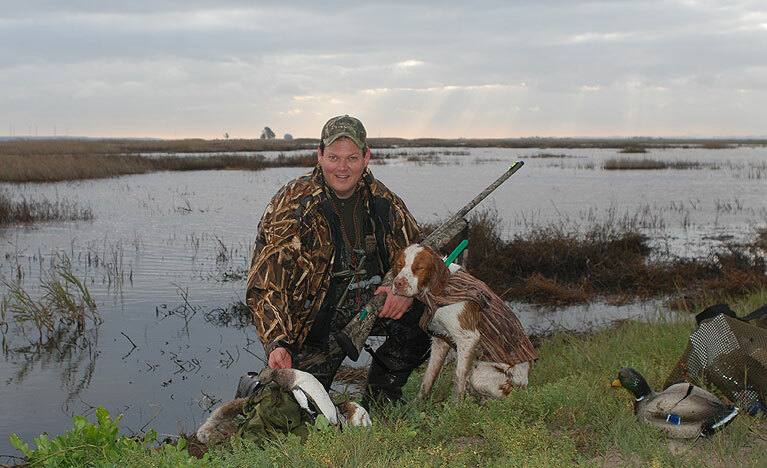 Too many hunters are want to build the biggest blinds on the refuge, especially the beginners. The smart guys, the ones who come back with stringers full of mallards and sprig are those who know how to take their profile down as low to the ground as possible. For years I used to drag out a major coffin blind that used to be manufactured by the Outlaw Decoy company in in Spokane, WA. Sadly they went bankrupt and I could never get another from them. Gianguinto has a better idea: get one of those cheap kids sleds you can find Walmart and Big 5, just about every sporting goods store that caters to skiers and snow enthusiasts has them. Paint the thing black or olive drab, and you can use it to pull your decoy bag out to the blind, and then you can lay down in it. Put on a camo facemask and you can call with impunity. You’ll be able to look straight up at the ducks and keep your call directed at them (something Billy and I talk about in the Cork’s Outdoors Radio interview below) and then all you have to do is sit up and shoot—you’ll be amazed at how many more ducks you’ll take this season! If you get started now you might have time to get your decoys in shape this season. Many have thousands, especially if you hunt a private duck club and put out your own dekes. Unlike many who’ve told me in the past that more females is better than males, master duck hunter and instructor Billy Gianquinto says it’s better to have more males in your decoy set. From how he describes it in our interview, I’d have to agree: much easier to see that silver-gray off a drake, than the brown camo of a hen’s feathers. Listen to Billy’s instruction below on a number things that will help improve your duck hunting this coming season: great calling sequences! Rabbits reside in the past memories of many as their introduction to hunting. Rabbits remind me of the elation of returning to the US after spending a childhood in South Vietnam and Singapore—where the only ones with guns were government personnel and guerrillas, and most of the hunting happening was of the two-legged variety. With a 16 gauge Marlin pump handed down to me by my father, who had last used it before he went off to lay down telephone lines across Latin America in the late 1950s, I ventured forth to Arroyo Seco in Los Padres National Forest. As I wasn’t old enough to drive, it meant that it was a family affair and we didn’t get to the forest during the optimum morning times, and left before the best evening times to make it back to the Bay Area before dark. One day, though, I got lucky. Our dog, that must have been a mix between either a beagle or Spaniel and a terrier, who loved to dig and chase, suddenly got onto a small cottontail that bolted and I shot. I only hit it with a few pellets, and not knowing how to finish it off with my hands, I simply stepped back and aimed again. Problem was that I didn’t really understand chokes and how I had to walk much further, else turn that small brush cottontail into hamburger. The experience almost turned me off hunting all together—I still don’t like to hunt small game with a shotgun, but more for not having to pick shot out of my meal. But then the next year, I got a Marlin semi-automatic .22 rifle with a tubular magazine! Even with the issued open sights, I could drill a rabbit through the head, wasting none of what would become my favorite meal. No more stray pellets puncturing the stomach or gall bladder, tainting the sweet cottontail meat…like chicken but so much tastier. It’s no wonder that my natural progression in adulthood would be back to the rifle that I was a introduced to shooting with in the first place: a pellet gun. Without all that “bang” that comes with gunpowder, I’ve come to enjoy the silence of hunting with a bow that in the world of rifles is most imitated by an air rifle. It’s really fun shooting a pellet rifle for a number of reasons: the ammo’s cheaper, it’s quieter, there’s an unlimited amount of propellant (we breath it every second) and there’s no smoke preventing you from keeping an eye on the target. 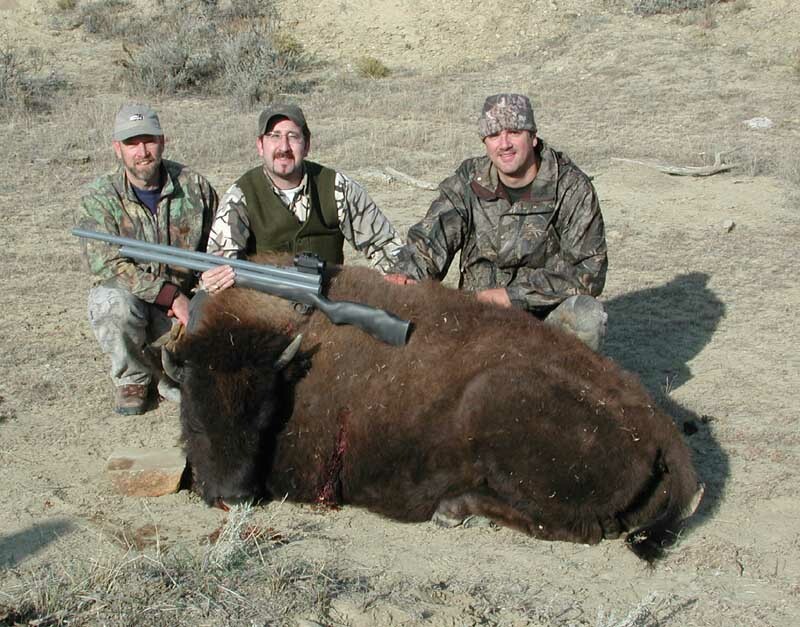 For this reason the airgun was used extensively during the 1600s and 1700s for hunting. In war, Napoleon saw the major effect of the quiet airgun, un-affected by rain, against his troops, that he had a standing order that all enemy combatants captured with an airgun in possession be executed on the spot. As a fanatic small-game hunter with a taste for large cottontails, I’ve learned the merits of putting a .22 caliber pellet rifle through it paces. While last year was my introduction to the break barrel offerings of Crosman, this year I plan to put their scoped Benjamin Marauder through a number of hunts! The Marauder, a rifle that uses an air reservoir much like ancient rifles, is similar to the AirArms rifle that airgun aficionado James Marchington uses on his own hunts for rabbits in his homeland of the UK, hunting in England and the Isle of Skye. A few months ago, I had the pleasure of watching his DVD release (I think I’m even the first one to get it in NTSC, instead of PAL). As Marchington stated in our interview that follows, technology has come a long way: how much easier it is to teach by producing a DVD as compared to publishing a book. 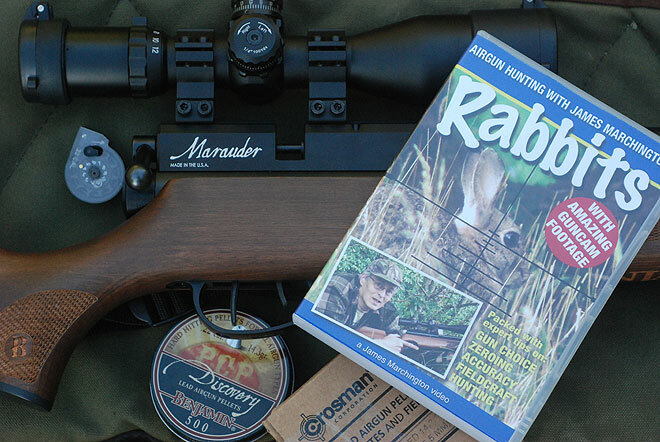 And what an entertaining lesson it is in his production: Rabbits — Airgun Hunting With James Marchington! Through a number of nicely shot scenes, the viewer is taught how to choose an effective pellet rifle, and type of scope to mount. In the field, some of it shot on the beautiful and very rustic Scottish Isle of Skye, Marchington takes the audience through a number of sighting and shooting sessions. The topics also touch on clothing (which I especially enjoy because he’s not wearing camouflage, but a good hunting tartan) and go in-depth into the skills of stalking and using the terrain to get close to the rabbit. If there’s ever a DVD to get for a child to show them something they can easily go hunting for, which would teach them to hunt just about every other game, this is it! So much out there is directed toward the adult, and really doesn’t cover the hunting opportunity of rabbits in a way that I’m sure will appeal to the neophyte hunter, young or adult. Those rifles mentioned are definitely “adult” pellet rifles, and Marchington stresses the important of all types of good woodcraft and rifle stewardship. Marchington makes a great teacher and yet another reason I highly suggest getting a copy to watch with your son or daughter. As for the hunting in the field (it’s not all about picking equipment and talking about woodcraft), Marchington mounted a Guncam on the rifle so that the viewer can see exactly what the shooter is seeing as he shoots. Very impressives footage and shows how effectively a .22 pellet rifle can dispatch a large rabbit as quickly as a rifle shooting a .22 long rifle cartridge. Track 1: James Marchingon talks about his entry in hunting in the Great Britain, and how much stalking rabbits is a great training aid for learning to hunt large game. Track 2: James Marchington touches on the topics of rabbit game species, air rifle options and new upcoming DVD productions for hunters.